Did the balcony collapse because of too much weight or insufficient strength? On June 16, 2015, a fifth-story apartment balcony in Berkeley, CA collapsed with 13 people standing on it during a 21st birthday party, killing 6 and seriously injuring 7. At the time of the incident, the building was less than 10 years old, making the balcony failure even more shocking. In this week's root cause analysis example, we'll take a look at some of the not so obvious causes that were found. This incident can be analyzed by building a Cause Map, a visual root cause analysis that intuitively lays out the causes that contributed to an incident. The first step in the Cause Mapping method is to define the problem by filling in an Outline. The Outline captures the background information for the incident, such as when and where the incident occurred, and it captures how the incident impacted the goals. Once the problem is defined, the next step is to analyze the problem by building the Cause Map. The Cause Map is built by starting at one of the impacted goals and asking “why” questions. For this example, we’ll start at the Safety goal and ask 5 why questions. Asking why five times gives us a good start to the investigation, but most incidents require digging a little deeper. More “why” questions can be asked to add a little detail and expand the Cause Map. Click on the thumbnail below to view a larger 27-Why Cause Map of this incident. So why did the balcony on a relatively new building collapse? The balcony was a cantilevered design attached to the building on only one side by support beams. At the time the collapse occurred, the stress on the balcony was greater than normal because 13 people were standing on it, but the design of the balcony should have been adequate to hold the weight. This is the straw that broke the camel's back, but in this case the camel's back had been weakened. Investigators determined that the balcony failed because the strength of the beams was weakened because of extensive dry rot damage. Dry rot is decay caused by fungus that can grow when wood is exposed to water, especially in areas with inadequate ventilation. Additionally, the party goers were unaware that the balcony was unsafe. There were some reports that tenants noticed mushrooms growing on the balcony in the weeks prior to the accident, but the structural issues with the balcony were not obvious, at least to the untrained eye, prior its collapse. The investigation into this incident determined that the balcony was likely built to codes that were in place when the building was constructed. Despite meeting the codes, the beams in the balcony were exposed to weather because of inadequate water proofing and dry rot occurred as a result of the water contacting the beams and inadequate ventilation. The final step of the Cause Mapping process is to develop and implement solutions to reduce the risk of similar incidents occurring. In this example, the balcony and one similar on the apartment building were removed and replaced by windows. People sometimes want to stop at this point. The component failed so we replaced it and solved the problem, time to move on to the next thing. But to improve overall reliability, it’s important to look beyond the immediate problem and really consider how the lessons learned could be used to prevent similar incidents. Replace the failed component but dig deep to understand why it failed and look at other components to see if there is a potential for a similar failure. It generally saves time, money and maybe even lives, if you can identify and fix potential problems before an incident occurs. 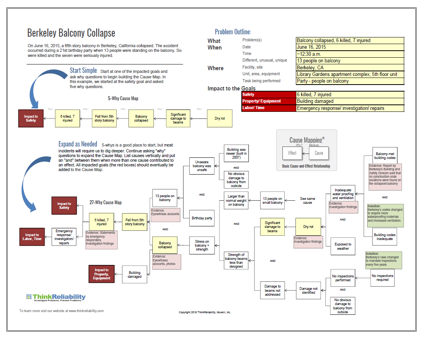 In this example, Berkeley has been working to improve balcony safety overall. Berkeley updated codes to require more waterproofing materials and increased ventilation. Additionally, a mandate has been added that requires balconies to be inspected every five years to help identify any potential safety issues with the balcony before more people are hurt. The impacts of this incident are still growing, and some safety advocates are working to change laws at the California state level to implement similar building requirements and inspections for the entire state. It's terrible when an incident occurs, especially when injuries and fatalities are involved, but it is even worse if we don’t learn from them.